Using Your Swim Spa as a Cross Trainer | Wickliffe OH - Leisure Time Warehouse | Hot Tubs, Swim Spas, and Pools. Ohio's Best Dealer! What if exercise and working out was convenient, hassle-free, and fun? Well it can be when you have a swim spa. They make cross training possible in one easy location. You can work on and strengthen your posture, core, muscle and joint pain, and even train for a triathlon all in a swim spa. Try running against the current to provide a core and leg workout that will be easy on your joints and best of all encourage blood flow to your muscles, which is great for body definition. To kick that work up a notch try running sideways against the current. This workout will turn on your core and strengthens your knee muscles. This exercise is great for weak or hurting knees. It’s gentle but effective enough to strengthen the muscles around your knee which will protect your joint. Make sure to do both sides of the body to balance it out. With a gentle current try doing high knees. While standing with the current hitting your front, lift your knee to your chest while holding your core tight. The pressure and resistance of the water helps maintain balance while you strengthen your core and thighs. To get more out of this exercise, point your toes as you raise your knee. This engages your calves and glutes and increases blood flow to those areas. Obviously, the swim spa is great to use to train for swimming. Choose the speed of the current you are comfortable with that will create a good resistance. You can swim as you normally would in a lane at a lap pool. Freestyle, butterfly, backstroke, and breaststroke are all possible in the swim spa. Swim for as long as you want, the current creates a consistent workout environment. When you’re done with your workout it’s important to stretch to keep your joints protected and ligaments flexible. And guess what- stretching is also possible in a swim spa! Stand with a gentle current against your front. If you have a kickboard, put your left hand on the kickboard and place behind you, your arm should be stretched behind you on the board. Place your right hand on the side of the swim spa, this arm stretched out as well. This will create a gentle twist that will stretch your chest, arms and core. Repeat on your other side. If you don’t have a kick board, just place your right hand on the wall while gently twisting your body to the left and vis versa for the other side. 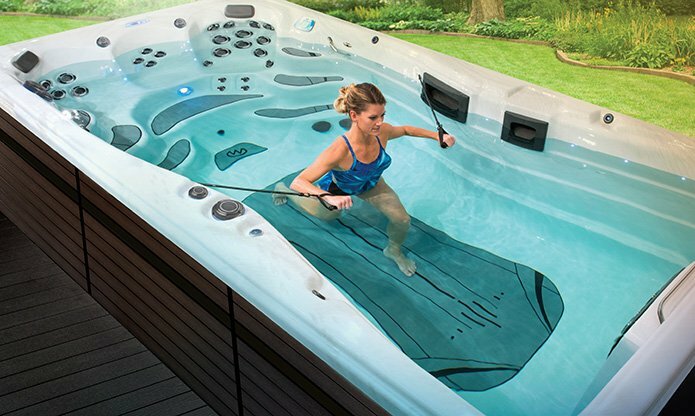 Swim spas provide an all body workout like no other! You won’t need a gym membership when you have a swim spa and LeisureTime Warehouse Wickliffe OH can help meet all of your swim spa needs. As a high-end luxury supplier of swimming spas and hot tubs, we make sure to match anyone’s needs when it comes to finding the right swim spa within your budget. Some of the swim spa products we offer are the Master Spas® MP Series and Michael Phelps Signature Series Swim Spa. Come visit us or call us at 440-623-7554 to learn more about our exclusive products!